Toyota Motor Philippines is adding a new variant of the Vios sub-compact sedan as a response to the Filipino consumer’s need for a no-frills automatic: the Vios XE. Slated to be unveiled at Toyota’s Media Thanksgiving Party next week, the XE marks the return of Toyota’s storied XE moniker which last saw action in the Corolla pre-2001. Slotting between the 1.3 J and 1.3 E variants, the Vios 1.3 XE looks rather basic with its 14-inch steel wheels with full covers, black-colored side mirrors and door handles. Having said that, at least it continues to have full power amenities as well as connectivity thanks to its touchscreen infotainment system. In terms of performance, the 1.3 XE comes with a 1.3-liter Dual VVT-i engine making 98 horsepower and 123 Nm of torque. This tried-and-tested engine is mated to a gearless CVT set-up which should make for comfy and stress-free urban commutes. And like all other Vios models, the 1.3 XE comes with a full range of safety features: 7 airbags, ABS with EBD, and stability control. 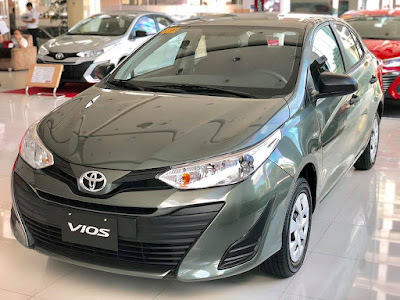 The 2019 Toyota Vios 1.3 XE will come in 4 colors: Thermalyte, Red Mica Metallic, Freedom White, and Alumina Jade Metallic with a retail price of P 735,000.